An amazing find (updated…it’s an April Fools)! 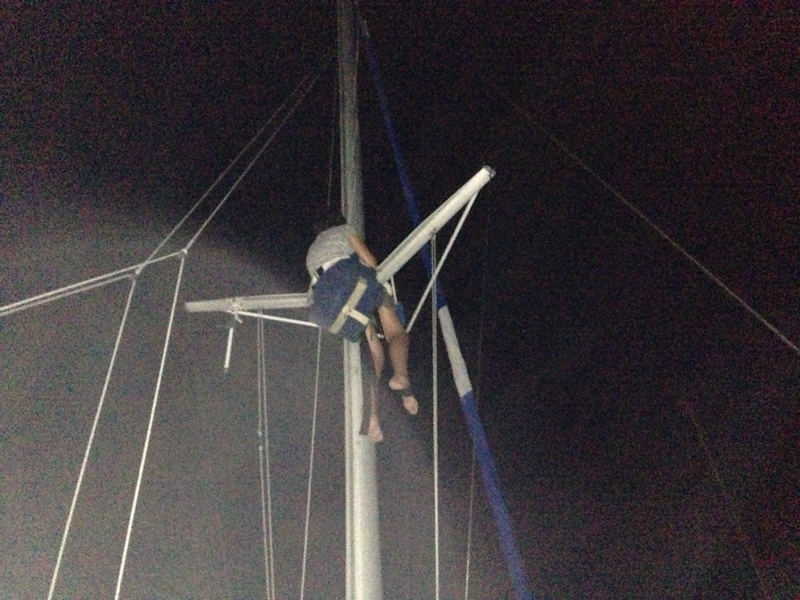 One of the chores that needs to be done regularly in warm waters is a good bottom scrubbing. 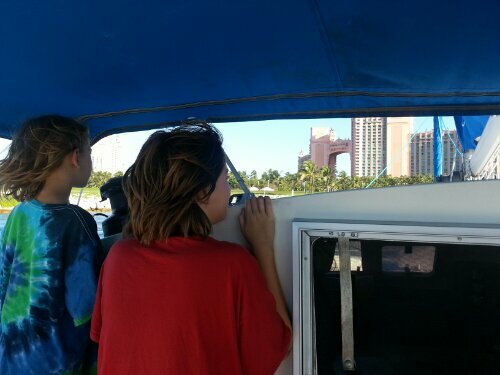 Not just for aesthetic reasons, since the boat moves more cleanly and efficiently through the water free of seaweed and gunk. Andy dove down with fins, mask, and brush to attack the keel. What he found was pretty freaking amazing. Up against the dock piling, he noticed an old jar sticking out of the mud. Madi loves to collect old glass, so he snatched it right up. The jar was filled with mud and muck, so he hopped up on the dock to give it a good hose rinse. Turning the jar over, a large clump of mud dropped down onto the dock. Andy was about ready to drop the mud into the harbor when he felt something substantial in the dark mass. Substantial indeed, as the mass contained four gold coins of considerable age. Hispania is clearly visible on the coins so it seems pretty clear what their origin was. They could be fake, as they sell these things all over down here, but they aren’t as shiny as the ones that you can buy in the gift shops, so even skeptical Andy is lifting an eyebrow. 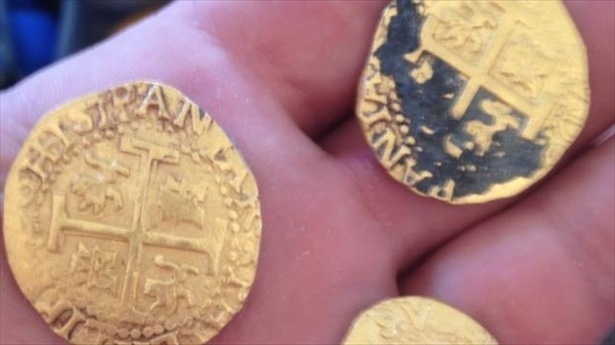 A quick search online shows that collectors pay anywhere from $1000 up for Spanish doubloons that look like these. Regardless of authenticity, we are through the roof with excitement here on Tango. We usually only find fishing line wrapped around our props. 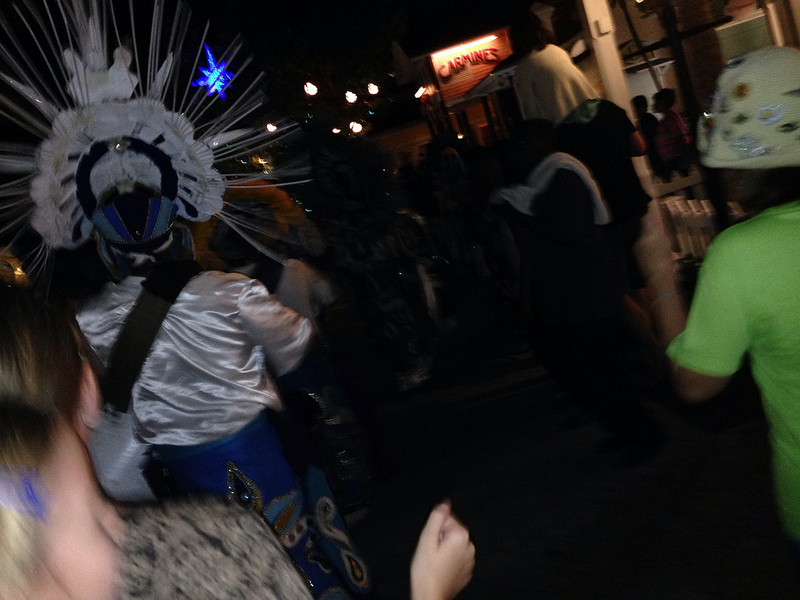 Happy New Year and Junkanoo from Nassau Harbour! 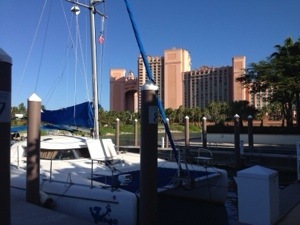 We had a quiet and relaxing day on the dock, washing underwear and such. What is Junkanoo you ask? Well, it’s a street festival that starts on Boxing Day (Dec 26) and goes through New Year’s Day. On Boxing Day, various groups who have been working on their costumes, music, and dance routines for many months compete to win the competition. The categories include Best Overall Performance, Choreographed Dancers, Free Dancers, Banner, Lead Costume, Off-the Shoulder, and Shirley Street. This year’s first place winner were the Bahama Valley Boys. For Bahamians, getting behind your favorite Junkanoo groups and smack talking other groups are like sports teams. It was fun to get folks going by mentioning how One Family got robbed of second place. We had every intention of wandering down on New Year’s Eve to watch the parade, but when we found out that it starts after midnight church services end (around 3AM), we all sighed big sighs and burrowed into our snugly book spots a little deeper. Yes, we lack motivation today. 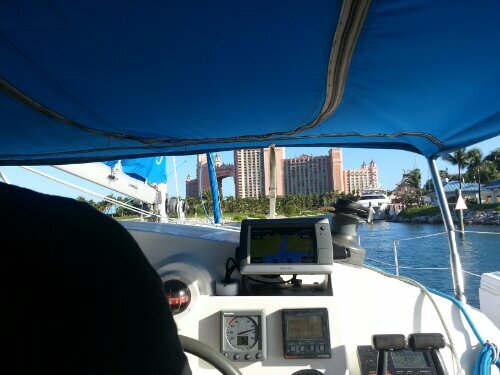 Since no one was up for a 3AM trip down to the Junkanoo festival we settled with this view from our cockpit. 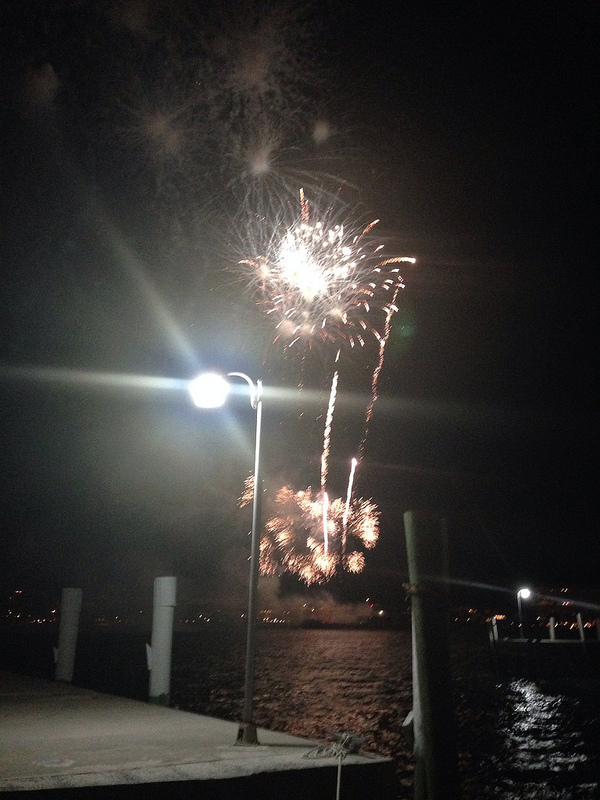 Some of the best fireworks we’ve seen, and this was just one of three barges in the harbor! We did see a mini Junkanoo parade at Atlantis, and we danced along after the coolness for a bit, so we did catch a bit of it. Today we arrived in the land of plenty! 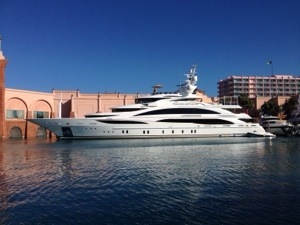 Mega yachts and high end shops abound. Time to suit up for water park Christmas fun! 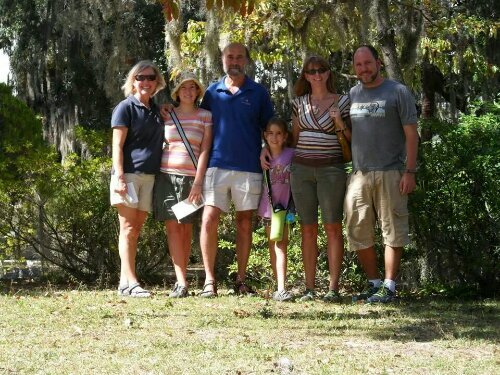 We also branched out into Savannah proper for fall things like pumpkin spice ice cream, local SCAD art, music in the park, and Oktoberfest with our friends from Haanli. 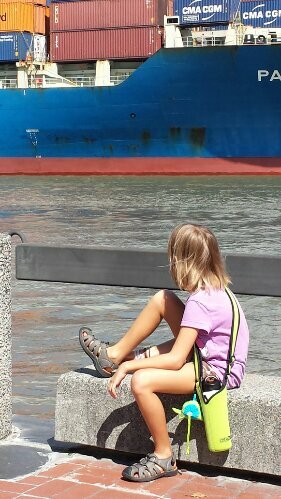 Peyton contemplating the ways of a cargo ship. 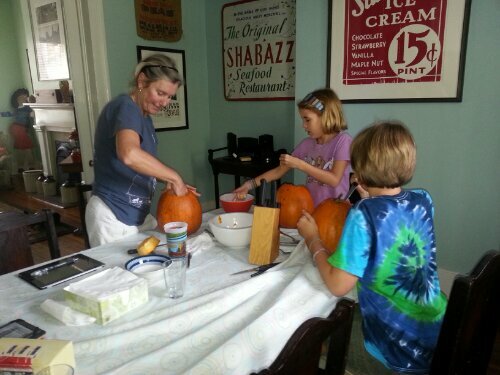 Carving pumpkins a bit early…just because we can! Happy July 4th, boaty style! 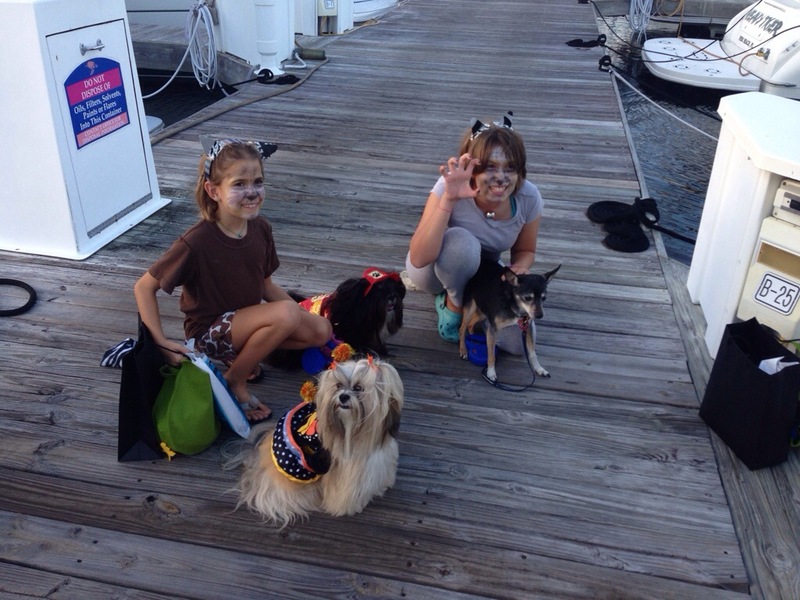 We undertook the long one-hour (ha ha) journey to the city marina on the 3rd to get nearer to Vero Beach’s fireworks display. It was fun being a different marina for a few nights, eating out, and walking on the beach. 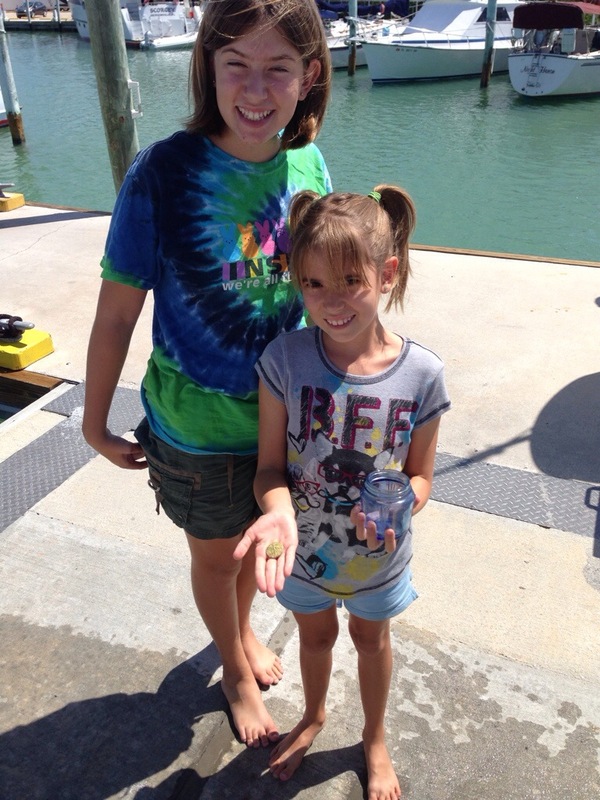 Vero Beach also has a free (FREE!) bus system, so we checked out the main library and loaded up on books. 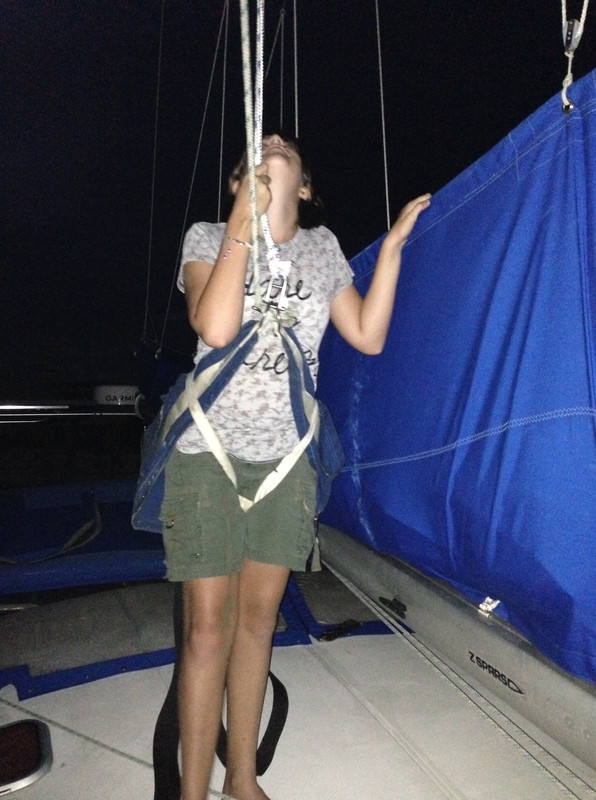 Madi, being the boaty girl she is, wanted to watch the event hanging from the main in our bosuns chair. 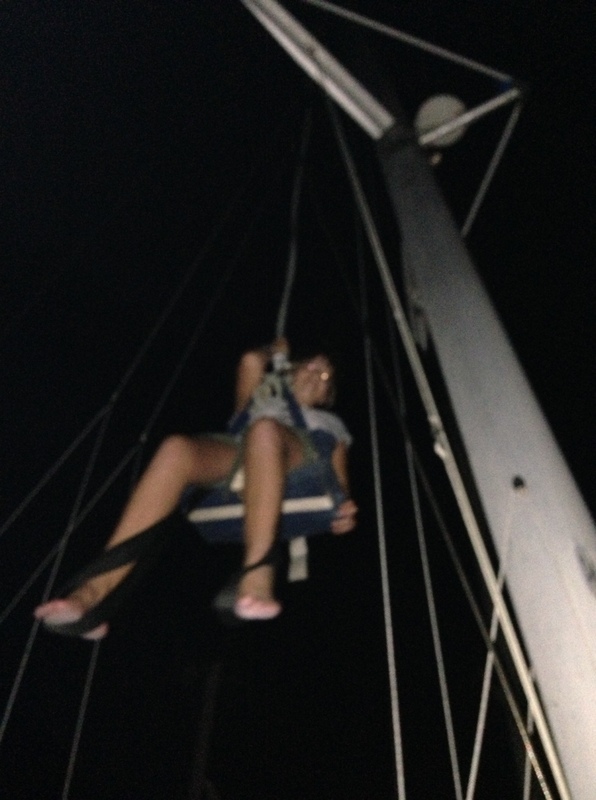 She has come so far…from saying, “NEVER make me go up the mast!” to watching a 30 minute firework display. Apologies for the poor quality, but we had to capture the moment! Madi is all settled…with the best view around! Happy Fourth of July to you all! Greetings all! It’s been a while since our last update but we wanted to take a moment to bring our blog up to date. Tango is currently safe and sound (we hope) at a marina in Fernandina Beach, Florida whilst we are enjoying time with family and friends in Washington State. We spent Christmas Eve Eve getting Tango ready for our extended absence. This consisted of closing off all of the various valves that allow seawater into the engine system, cleaning, shutting down all electronics, and priming the water system with antifreeze in case there is a deep freeze while we are gone. Not likely to happen in Florida but better to be safe than sorry. We left before dawn for our 7AM flight out of Jacksonville. Our taxi driver was a very nice fellow who was just coming off of a long shift. I was glad that we were his last fare and that he could spend a restful Christmas Eve with his family. The flight was uneventful except for a very uncomfortable terrier who whined for the majority of the trip. I don’t blame him. I would whine too if I was stuck in a small carrier for over 6 hours. The flight crew from Jacksonville to Atlanta was very cool and let Banyan sit on Robin’s lap. The trip from Atlanta to Portland was a different story. Three of the four flight attendants had no problem with a lap sitting terrier but the fourth insisted that Robin put him in the carrier. I know rules are rules but he cried for the remainder of the trip after that. Scroogey lady. 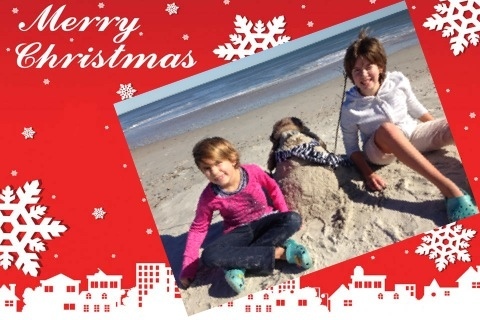 We have had a wonderful Christmas/New Years week visiting with everyone. We are staying with my mom in the house that I grew up in. So many memories. I really hope we can buy this house when we are finished with our voyaging. The only real issue was that there is a stomach bug making the rounds and Madi and the relatives spent the better part of Christmas running to various bathrooms. Stomachs are settling down though and New Years eve finds everyone in good health. We spent Saturday night at the legendary Washougal bar, The Bigfoot, catching up with friends and being ridiculous at the Karaoke machine. I had way too much liquid joy for that evening but, apart from a headache the next morning, I made it through unscathed. The 2AM run to Taco Bell helped. We are spending this New Years Eve at mom’s. Madi is furiously baking like a mad woman. She has already created a lovely cherry cheesecake and is now working on some sugar cookies. 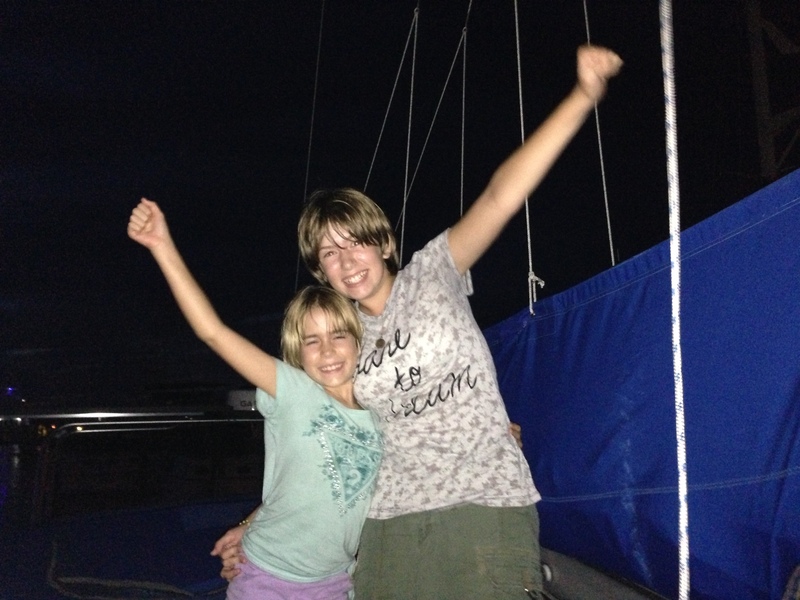 It is nice to have some quiet house time after motoring our boat down the ICW for the better part of two months. We wish you all a wonderful 2013. 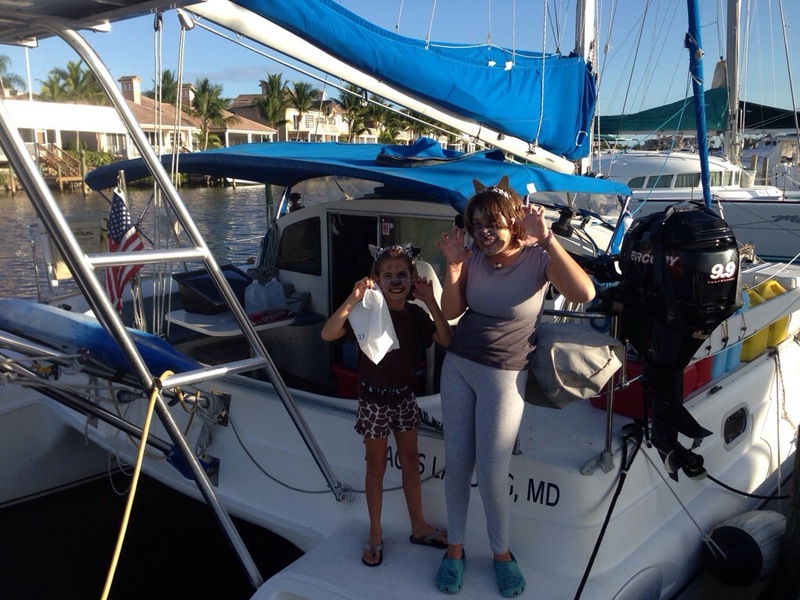 Stay tuned for more from Tango as we make our way down the Florida coast to Miami, the Keys, and points south. 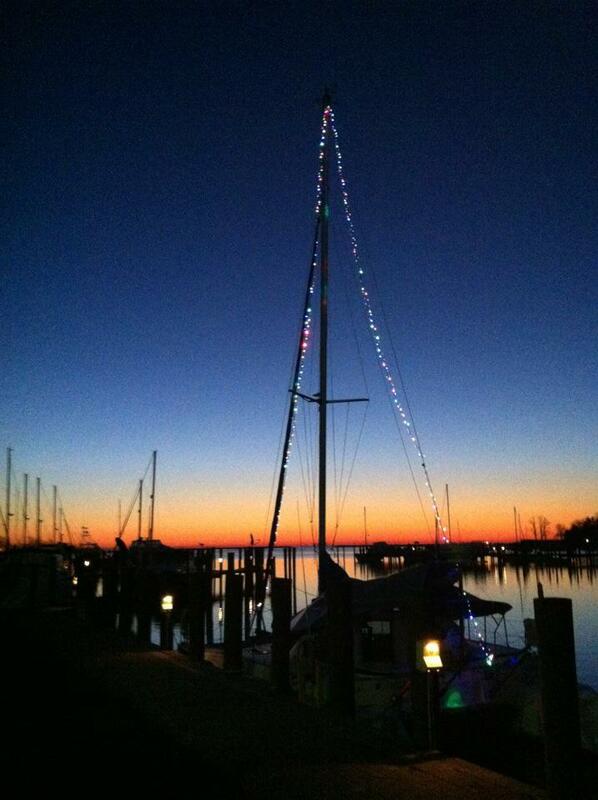 Happy Holidays from Fernandina Beach, Florida! We decorated for the holiday…well, sort of!